"From the highly acclaimed, multiple award-winning Anthony Doerr, a stunningly ambitious and beautiful novel about a blind French girl and a German boy whose paths collide in occupied France as both try to survive the devastation of World War II. Marie Laure lives with her father in Paris within walking distance of the Museum of Natural History where he works as the master of the locks (there are thousands of locks in the museum). When she is six, she goes blind, and her father builds her a model of their neighborhood, every house, every manhole, so she can memorize it with her fingers and navigate the real streets with her feet and cane. When the Germans occupy Paris, father and daughter flee to Saint-Malo on the Brittany coast, where Marie-Laure&apos;s agoraphobic great uncle lives in a tall, narrow house by the sea wall. In another world in Germany, an orphan boy, Werner, grows up with his younger sister, Jutta, both enchanted by a crude radio Werner finds. He becomes a master at building and fixing radios, a talent that wins him a place at an elite and brutal military academy and, ultimately, makes him a highly specialized tracker of the Resistance. Werner travels through the heart of Hitler Youth to the far-flung outskirts of Russia, and finally into Saint-Malo, where his path converges with Marie-Laure. Doerr&apos;s gorgeous combination of soaring imagination with observation is electric. Deftly interweaving the lives of Marie-Laure and Werner, Doerr illuminates the ways, against all odds, people try to be good to one another. 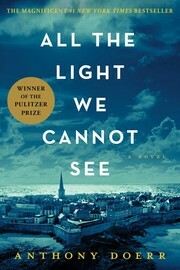 Ten years in the writing, All the Light We Cannot See is his most ambitious and dazzling work"-- Provided by publisher. Donated by: Bernie & Sue Schneiderman in honor of Sally Morgan and Deborah Washofsky. $c Statement of responsibility Anthony Doerr. 541 Acq Source Note $a Source of acquisition Bernie & Sue Schneiderman in honor of Sally Morgan and Deborah Washofsky.